Today is a full moon on Friday the 13th - does that mean anything? Are you afraid? Should you be? THEY ARE THE two great superstitions in Western culture and today, for the first time in over a decade, Friday the 13th and a full moon fall together. There is just a 5% chance of a year having a full moon on Friday the 13th, so the occurrence is statistically only going to happen once every 20 years. The last time the two fell together was 13 October 2000. But, where does the Friday the 13th superstition come from? In truth, nobody really knows. Its origins go back to the 19th Century and it has been suggested that 13′s proximity to 12 is to blame. Twelve is seen in many cultures as a number of roundness and completeness. There were twelve apostles, there are twelve hours on a clock, months in a year, twelve deities of Olympus, twelve tribes of Israel and twelve years in the Buddhist life cycle. Thirteen however, was seen as odd and incomplete. Friday is mentioned as an unlucky day as far back as the 14th Century, where Chaucer says “and on a Friday fell all this misfortune”. Is the day any more dangerous? Statistically speaking, yes and no. Very few datasets exist on the subject, but a British Medical Journal study from 1993 found that traffic accidents in a London suburb increase on Friday the 13th. However, that is a small study of a narrow dataset. Besides, the date is purely a consequence of a calendar. It has no power to affect events. What it can affect, however, is behaviour. Studies in Finland and Germany found similar results. In Finland, governmental and nongovernmental organisations led by the Ministry of Social Affairs and Health promotes National Accident Day, which always falls on a Friday 13th, taking advantage of the superstitions. 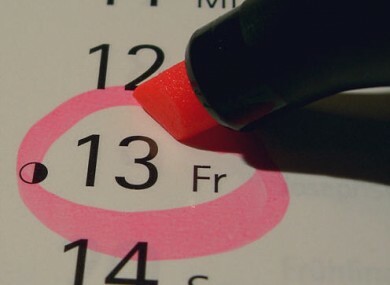 In fact, studies show that the stock market actually performs slightly better on Friday the 13th. The idea that the moon can influence human behaviour is actually sounder. This is because the lunar cycle is not a human construct. But, again, the stats don’t support this idea. Repeated studies, including this one, show that there is no link between the lunar cycle and violent crimes or temporary insanity. Poll: Are you superstitious about Friday the 13th and full moons? Read: Are Irish couples afraid to get married on Friday the 13th? Email “Today is a full moon on Friday the 13th - does that mean anything?”. Feedback on “Today is a full moon on Friday the 13th - does that mean anything?”.